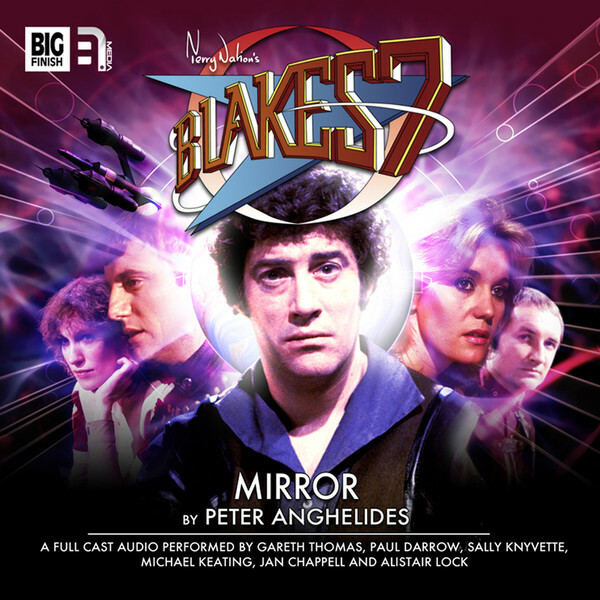 Big Finish: BLAKE'S 7, 1.4 – MIRROR Review | Warped Factor - Words in the Key of Geek. Tony looks in the mirror. Blake’s 7 was, above all, a dystopian space opera. It was never more operatic than when dealing with some of the Federation’s insanely convoluted traps and snares, usually set by an unhinged Travis and unofficially supported by Servalan. Who can forget the android madness that was Project Avalon? The attack on Central Control that cost Gan his life in Pressure Point? The chicanery that led to the foiling of Glynd and Le Grand’s revolution in Voice From The Past? Welcome to Mirror, by Peter Anghelides, which is very much in this territory of insane plotting, double-bluffs, triple-bluffs, people not being anything like they seem to be and Travis being a thoroughgoing melodramatic moustache-twirler. The story kicks off with a slice of Jenna’s backstory – Space Major Kade, the man who killed her father, has been located, and she ‘needs’ the catharsis of killing him. Unwisely then, Blake appoints Cally to go down to the planet Vere and get him, while the rest of them, Jenna most particularly, go to the middle of nowhere, where Orac has located the MacGuffin that’s been haunting us for three episodes – Federac, the Federation’s equivalent of the Liberator’s most petulant box of tricks. Stellidar IV, the location of the fabled Federac, is a rock in a whole lot of space, with apparently nothing but an automated supply ship occasionally dropping off loads there. Except when Blake and the gang hijack the supply ship, it has a human back-up pilot named Locklan on board, and when they arrive on Stellidar IV, things get more and more unlikely, raising Avon’s hackles. Jenna, having been left behind on the Liberator (seriously, Blake? Annoy your pilot and then leave her in charge of the ship? ), legs it straight back to Vere, where Cally’s been caught up in a battle of the Federation’s pin-up boys – Travis, played by Brian Croucher, is snarling his way through the market, chewing the furniture and blasting the locals, before meeting up with Kade. Kade thinks he’s bringing Jenna with him, but clearly, this being Travis, who probably sleeps on a spiral staircase so he can get up early and lie some more, that’s not what’s really going on. The thing is, if Kade’s been outplayed by Travis because he doesn’t know what’s really going on, there’s some evidence that Travis doesn’t know what’s going on either. There’s an absolutely giant pile of evidence that Blake and the gang have no idea what’s really going on for most of the way through the story, and the truly perverse thing is that even those who really do know most of what’s going on are actually chronically misinformed about events in a different strand of the story. It’s a whole tapestry of levels of what Zen would call ‘Information,’ what Avon would call a ‘perfect set-up,’ and what listeners will recognise as a classic Blake’s 7 build-up to a somewhat expected anti-climax. The nature of what Federac really is comes as little surprise, especially to fans who remember Series C and D, and there are arguably a twist or two too many, especially a sequence at the end that allows Blake, Avon and Villa all to prove how strong they are. Yes, really – even Villa. There are a few vocal moments of madness too – using Michael Keating, with his highly recognisable voice, as an additional character in a Blake’s 7 story smacks of laziness, particularly if you’re going to just have Michael Keating putting on a cod Arabian accent and inflection. Paul Darrow is difficult to argue with even at the worst of times, but here, uniquely so far in the range of full-cast Blake’s 7 audio stories, he sometimes gives the impression that Avon has to heave his head up out of massive hangover in the corner to say a line, and then go back to nursing his sorrows. Most odd of all though is Brian Croucher’s Travis. Croucher’s version of the character always seemed to exist mostly to be the villain in a science fiction show, as compared to Stephen Greif’s interpretation, who seemed to be alive independent of Blake’s 7, for all his monomania surrounding Blake’s destruction. Here though, Croucher hyper-extends the moustache-twirling nature of his villainy, partly due to the writing of his lines, and partly down to a deadness in the voice that fails to rouse Travis into the emotional intensity he needs behind the coldness of his actions. Here, Travis kills people for no better reason than that they happen to be in the way of his footfalls, and yells almost bored threats even as he himself is in mortal danger. It feels like a rocky start for Travis’ proper involvement in the full-cast audios, the product of both Anghelides’ writing and perhaps Coucher’s easing back into a role he made his own some thirty-five years ago. There are treats in this audio though. Keating as Vila is one of them, and both Sally Knyvette as Jenna and Jan Chappell as Cally add a bit of dramatic meat to their characterisations. Alistair Lock seems to be having almost bifurcated fun arguing with himself as both Orac and Zen, and we welcome Hugh Fraser to the Blake’s 7 audio world, extending the scale of the Federation’s villainy beyond Servalan’s reach as he embodies the President of the Federation for the first time, bringing a voice that always seems to be checking its natural silkiness to bear – we being to hear the kind of mind it takes to rule the Federation absolutely, and it’s an exciting development to go above Servalan’s head while she’s still pursuing her career at Space Command. Above all though, the appeal of Mirror will be the convolutions of its storytelling, nostalgic as they make us for the on-screen show, where all hope would be built and built and built, only to come crashing down in a web of almost-incalculable, improbable deceit. You know you love that kind of dashing of hope – if you didn’t, you probably wouldn’t be a Blake’s 7 fan, with both its bleakness of tone and its BBC budgets. And if you love the building up and dashing of hopes in a solidly entertaining way, then you’ll get more than your money’s worth out of Mirror. The mysteries will twist you round their little finger, because Peter Anghelides knows how to work his plotting levels, and even if Travis sounds off and there’s a twist or two too many, you’ll stick with it all the way, if only to find out what the hell actually is going on.